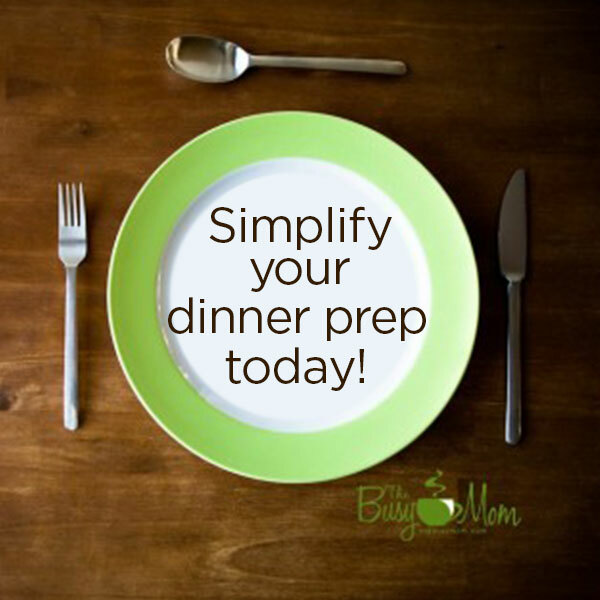 Simplify Your Dinner Prep Today! Am I the only mom who has come to dread the 430-6pm hours of the day? Man, these people, they want food every single night!! There has got to be an easier way to do this. It seems like freezer meals and once-a-month cooking posts are all over the place these days! For a long time I couldn’t see why this would be necessary. Well, I’m about to start my second year homeschooling, and am almost through my first trimester with our fourth baby, and it’s become pretty clear that cooking dinner is no longer my strength! Over the past few months I’ve been looking for a few ways to simplify the process. Thus far, I haven’t done a lot of fully cooked and frozen meals, but have focused on the most time consuming part of the process – MEAT! For me, just having this step completed has made it SO much easier when 5 o’clock rolls around. Here are a few ways I try to batch cook meat so it is ready ahead of time. Ground beef ~ I’ve found that on a day when I am making something that requires ground beef, it is almost no additional effort at all to do it in a large batch. I buy the family size packages at Costco or Wegmans (sometimes 2 if I’m feeling brave! ), brown the meat (sometimes with garlic or onions depending on what I am cooking), use enough for dinner for a night or two, and freeze the rest. I’ve done this with spaghetti sauce, chili, lasagna or tacos. It can be done with meatloaf too, although it is more time consuming to do ahead of time in bulk. Rotisserie chicken ~ What would I do without Costco’s rotisserie chicken? This has saved me on so many evenings! Aside from the last minute dinner though, it has become an ingredient for many other recipes. Casseroles, soups, salads, there are so many options! On a day or evening that isn’t overly full, I’ll buy 5 or 6 chickens, pick them all and cut up the meat, then freeze in 2 cup portions to use in any of these recipes later on. and frozen at one time. Definitely more time consuming than cutting up a cooked chicken, but worth it! Last time I ordered 2 boxes. My husband and I worked together, and in one evening we had 80 pounds of chicken prepped and ready for different meals. Sometimes I have gone the most simple route and just trimmed, frozen and bagged the chicken. Sometimes I make up a few marinades to add to bags or simple recipes and freeze a few portions of it that way to have a few ready to bake servings too. There’s nothing amazing here, and I’ve also just learned to simplify our meals in this season for us. As much as I love fancy recipes (I’m a bit of a foodie), I’m just not in a season of my life where it serves my family well to cook involved recipes. But maybe there are some others who are looking to save time in simple ways like I am! 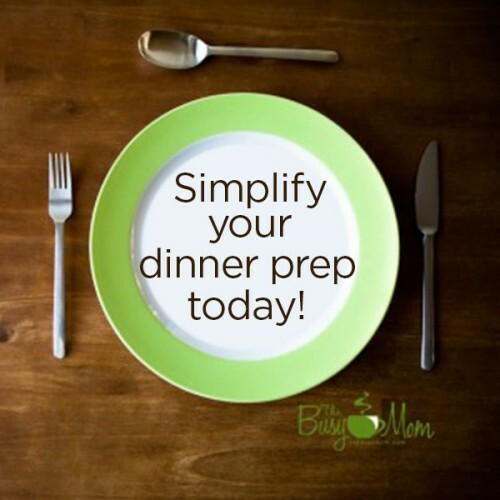 What are ways you have been able to simplify cooking processes in your home? 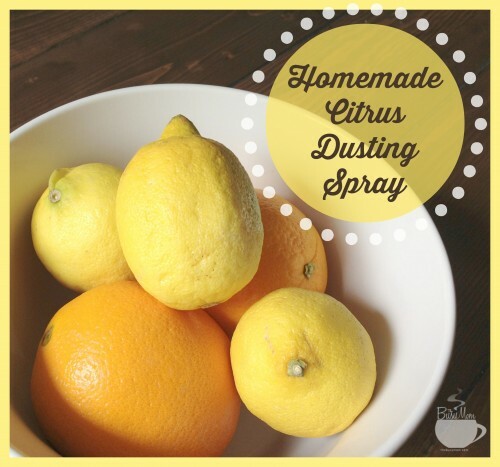 So, where else to turn but Pinterest to find a recipe for your own dusting spray!? Voila! Of course, being the tweaker that I am, I had to tweak the recipe just a bit to get it how I liked it. But, so far, so good on the citrusy smelling, clean living room! I love making my own cleaners and hygiene products, you might remember I shared a citrus all purpose cleaner here at The Busy Mom, but I have a few other recipes on my blog, too! I usually use warm water when mixing things like this, but not hot, for the benefit of the oils. Also, I shook mine a few times to get the oil mixed a little better. Just shake as you use. So, the only negative to this homemade spray is that now I have no excuse not to dust. 🙂 Good thing I have several children that are old enough for this chore now! It seems like especially during the holidays, sugar is EVERYWHERE! I’m not here to debate the amount of sugar your children should or should not have. That is something you have to decide for YOUR family. I think we would all agree, though, that too much sugar is not good for any of us. Some kids show obvious effects of sugar and some do not. You know your kids and have a feel for their limits. I’d like to share with you a few tools that I have learned over my 23 years of mothering, to help keep down the amount of sugar consumed by our family. As a result, I can honestly say that, slowly, our family’s daily sugar intake has decreased over the years. We do a lot of baking during the holidays. Most of what we make is not what we would normally eat, but our kids have warm memories associated with them. And who am I to bulldoze their memories? We head to the dollar store, buy some baskets and ribbon/raffia, jingle bells, etc to decorate and some tissue to line them. We bake and “taste” to our hearts content, wrap up our goodies, put them in the baskets and promptly give them to others: neighbors, friends, family. This accomplishes a few things: It keeps the temptation down by keeping the sweets out of the house, my kids’ memories aren’t squashed and they learn to serve and share what they have with others! It’s a win/win. Can I just say that there will be many who will not be particularly helpful in our plight? Grandparents, bank tellers, and others often want to give our kids candy canes, etc. All in good Christmas cheer, of course. Easy fix. Just thank them (and have your children thank them) for their thoughtfulness and then promptly (when out of visual range) place the goodie in your purse or bag to add to your collection. Use these treats for rewards or for days when your child hasn’t reached his/her “limit” and would really enjoy it! By doing this you are encouraging both self control and grace toward others’ intentions. It can be hard to get our kids on board with the plan, but I have explained it to ours this way: “There are soldiers in your body that fight off the germs that try to make you sick. When you eat sugar, it’s like taking the weapons from the soldiers and they can’t fight off the bad guys.”(This is a particularly effective visual for boys!) Sugar does suppress our immune systems for several hours after we eat it. Who wants to take that risk too often during the height of cold and flu season? Count me out! Even after a valid explanation, your kids may not be keen on this idea of setting limits with sugar. That’s ok. It could just be one of those many unpopular decisions we have to make as parents. After all, we ARE the mom. Have you ever heard the saying that wherever your treasure is, there your heart will be also? Today, I want to talk to you about a different kind of treasure. I want us to look at the treasure that is sought by the choices that we make. Did you know that your choices reveal what you love the most? It’s true. And in marriage, the same thing can be said. So what does this have to do with balance? First, we need to work to please God, not others. Second, and it may not seem obvious at first, but if you read from verse 17 back down to that parallel verse, verse 23, you will see something that stood out to me: I noticed that all of the verses in between 17 and 23 talk about the importance of relationships. Those verses are all about healthy family relationships: wives and husbands are supposed to be in loving relationships with each other; we read that fathers are not to exasperate their children. God’s Word is telling us that good works situations and healthy family situations go hand in hand. This takes prioritizing and balancing. Sometimes, good things rob us of the best things. Some of you are struggling in your marriages because you haven’t had time to spend with your husband. Life has been too busy, too chaotic and too stressful. As a result, you’ve been struggling to find time (or even just desire) for intimacy or just finding time to relax together. Maybe you’re exhausted at the end of the day. Believe me, when I tell you that I get that. 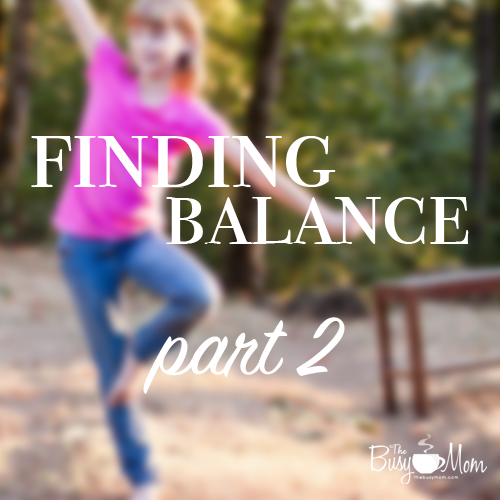 Most of the time, finding balance means letting go what those things that are causing the most stress. Of course, we can’t always do that! Sometimes, my kids are causing me the most stress! Here’s the thing. If my kids are causing me stress, I can almost always trace it back to something in my life that’s out of whack. Either I’ve been neglecting them by not disciplining them when it’s appropriate (and their behavior is showing that lack of discipline) or I’ve simply spent time that I could spend with them on lesser important (but also good) things. When this happens, they’ll do almost anything to get my attention. Even misbehave. Balance is not an easy thing to figure out. If you’re looking for a place to start, start with relationships. God says over and over again that relationships are important. In fact, we know that God loved the world so much that He sent His son to die for us while we are still sinners, Christ died for us. So we need to recognize the importance of relationships. As I’ve said before, I believe that for married women who are also mothers, the answer to finding balance at home lies in recognizing the importance of nurturing our marriages first. Start with your marriage. Healthy marriages are a key component to healthy children. At the end of the day, it’s usually the “good things” that hang us up. I’ve learned that I need to be intentional in saying “no” to some things even though they’re good. For example, we might need to say no to that extra curricular activity. Maybe it’s not wise to do a Bible study this season, even though it would be great and we know it would be a good thing for us. 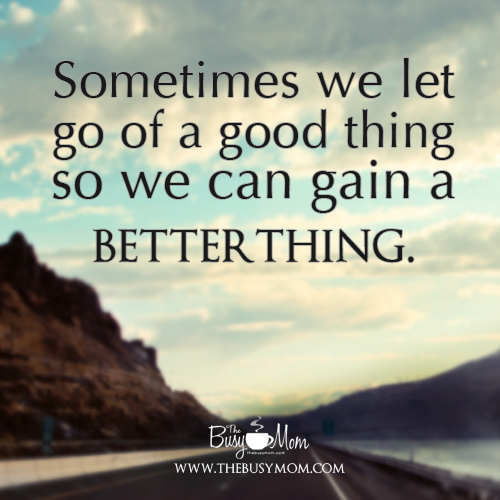 Sometimes we let go of a good thing, so we can gain a better thing. If you’re struggling to find balance in your life, I want to encourage you today to say “no” to those things that are hindering relationships in your home. Maybe, if you say no to something, you can say yes to something more important, like “yes” to dinner out with your husband, “yes” to going to bed early, “yes” having a date with your husband. You know, the best thing you can do for your children is to have a strong and healthy marriage. To focus on anything else would be doing your children a disservice. You can find balance between work and family. Not every family is going to have an ideal situation, but as the mom, you are the one who largely determines what that balance is for your family. Take some time to sit down with your husband and collaborate together. If you’re a single mom, find a quiet moment and reevaluate what really matters. Pare down what needs to be pared down. Breathe. Then, whatever you do, work heartily for God and not for men. That’s where peace and balance can be found. Somewhere between diapers and diplomas—it’s there. We just have to keep at it. I have been talking to you for the last couple of days about priorities and today, we find ourselves in the book of Galatians, in chapter 6 verse 9. I have talked about this verse before, but today I want to give a little spin on it at look at it from a different angle. So, once you determine what your priorities are, you want to act upon them. Don’t sit around, but make steps in the right direction. Sometimes, it just means sit around and read to your children. Sometimes, it means we need to manage our homes so there is no chaos in the evening or chaos in the morning. Sometimes, it means we need to spend more time with our husband. Once you’ve figured out what your priorities are, you have to take steps to act upon those priorities. So, the question that you want to ask yourself today is: Where am I going? A few days ago, I was talking to the Lord about this. Before my surgery, I was really been feeling burdened, because we had so many things going on in our lives—and we knew that we had some things coming up that are going to take me “off the grid” for a while. I’ve been worried about those things and have been praying about them. I really sensed the Lord saying, “You know what? You need to rest in Me.” Let me tell you, moms, I have a hard time doing that. And so, I sat down and began to write some things down that I felt that the Lord was prompting me to write. Wouldn’t you know it? One of them was just for me to slow down. Now, some of you may be the opposite of me and need to get up and get moving, yet some of you may be like me who need to slow down and enjoy your children more. And so, I told one of our kids to go and pick a missionary story because I haven’t read to our kids in a little while. I used to read to them all the time, but now I have adult children and little children and middle children, and, you know, the whole thing. And, I find that those things that I love doing are getting lost somewhere. So, my determination was to act upon my priority, and my priority was to read to my children. So, I developed my own P.O.A. – a plan of action. I want to encourage you today as you go about your day remember the golden rule of time management. As you prepare to act upon the priorities that you’ve determined, the golden rule of time management is it’s not time management but ME management. At the end of the day, you’re the one who determines how you spend your day, busy mom. Ask your children how you’re doing, sit down with your husband, and write out your goals together. And trust the Lord to help you find balance in your life.